Hooray it’s pantomime time! Well, nearly. 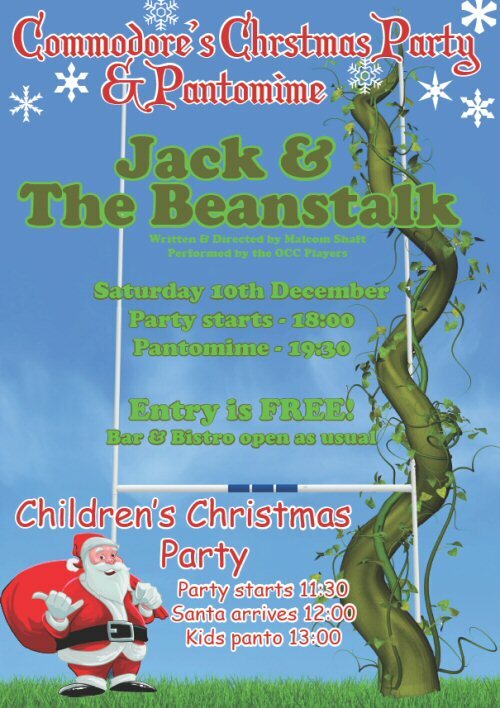 The annual Commodore’s Christmas Party and Pantomime is coming soon – make sure you mark the date in your diary – Saturday 10th December is the big day, and we look forward to welcoming you all at the club for an evening of festive fun. The panto this year is Jack & The Beanstalk, with a rugby twist… Come and watch the ‘OCC Players’ make grand fools for themselves (who’s got the video camera?! ), and party the night away with friends old and new. Check out the poster for more details – entry is FREE and the party starts at 18:00, with the panto starting at 19:30. 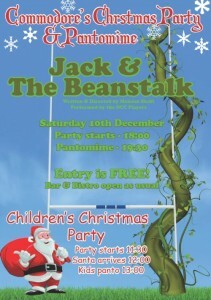 Earlier on Saturday 10th December it’s the Children’s Christmas Party too. Make sure you come along from 11:30 to be in with a chance of seeing Santa… Although he tells me his schedule is very busy this time of year, he did say he might just have time to pop in with a bagful of goodies around 12:00. Plus there’s the matinee performance of Jack & The Beanstalk for the kids at 13:00.